The Arab Association for Human Rights (HRA) condemns the actions taken last week by MK Michael Ben-Ari. He photographed himself tearing the New Testament out of a copy of the Bible and he published those photographs online. We believe this constitutes a provocation to the every religious person’s feelings and it contributes to the animosity between religions in general. The HRA, in principle, condemns every action that contradicts with the respect of all universal rights, especially when this act is committed by states or members of the Knesset that should represent their people and the their country. The HRA calls on the state of Israel and all its political institutions to respect all religions and religious places equally. Additionally, the Israeli government should take the necessary actions to prevent further violations to every person’s right to freedom of religion. The HRA recalls that this offense is not the first time that Muslim and Christian holy places or beliefs have been attacked. In recent years it has become a phenomena for militant Jewish Israelis and settlers to burn Mosques, Qurans, and Bibles. The perpetrators of these actions have seen no adequate punishment. Israel cannot continue to present itself as a democratic, civilized country and ask the world to deal with it as such while continuing to defend violations of basic human rights against those who don’t believe in its religion or its policies. The HRA calls on all embassies and foreign representation in Israel to clearly condemn these actions, especially considering an Israeli government official committed these actions. This action constitutes a grave attack against the feelings of Christians and Muslims and their beliefs. These embassies should present to their constituencies the truth of this attack and other instances of Israel failing to defend the basic human rights. They should call on their governments to officially condemn these actions and to take further actions to prevent similar attacks in the future. Finally, the HRA, in confirmation of its position stated above, calls on the Attorney General of Israel to start an official investigation against Ben-Ari. He should not be granted immunity because that would implicitly approve and legitimize further attacks in the same vein. If your campaign messages are to believed, Israelis need to get ready for a return to the halcyon times of strong American-Israeli relations. You’ve promised a rededication of American spirit (and money) to Israel and better military cooperation. On your website, you applaud Israel for being a “beacon of Democracy and freedom” and you promise to fight the worldwide “anti-semitic” campaign to delegitimize Israel. This is an honorable goal. There is a lot of anti-semitism in the world and it is a problem. What could be better than a strong relationship between two nations equally dedicated to the implicit social contract inherent in any good democracy? Short of a bucket of orange slices after a peewee football game in the fall or some cheesy grits, not much. Unfortunately, your website doesn’t stop there. As you know, the final line on the Romney 2012 website’s “Israel” section reads, “Israel’s existence as a Jewish state is not up for debate”. My question, on behalf of the Palestinian Arab minority in Israel is, Why not? What’s wrong with a good debate between equal players who have a safe forum to express grievances in so doing they may together find some middle ground on their differences. And heck, you’re pretty good at them. A debate can also be a forum for ideas. Given the absence of a foreign policy focus in your campaign so far, it seems like you could use some new ideas. How about this one? The “Prawer Plan”, an Israeli initiative to redistrict the Negev desert is going to cause a mass dislocation of its Arab Bedouin residents. Up to 70,000 people could lose their ancestral homes. By 1837, only 46,000 Native American Indians had lost their land in the Southeastern United States. This “Prawer Plan”, which American aid is implicitly sponsoring, represents a tragedy for almost twice as many people as the infamous “Trail of Tears”. That’s one thought. Here’s another. I know how much your parents love each other; what if your mom wasn’t allowed to see your dad because he was born in Mexico? This is the case for many Palestinian Arab citizens of Israel. These citizens of Israel can’t legally see their husbands and wives just because of their spouse’s nationality. Of course, to discuss these Palestinian Arab citizens of Israel and their lack of the basic human right to raise a family might bring the “debate over Israel’s existence as a Jewish state” to the forefront. Your advisors will tell you, and they are right, that bringing this up would not be popular with the American public. You will probably lose a bunch of percentage points against Obama in key swing states, just like they say. I know you said you wanted to do the opposite of everything Obama has done on this issue, but your advisors are right. It wouldn’t be a safe move to differentiate yourself here, if your top priority is winning the election at any cost. But, it would be the right thing to do. If this is going to be the “American Century” like you say, it is time to rededicate ourselves to the American values that made our country great; freedom, liberty, and justice for all. That is the American creed and it should be the foundation of any American incursion abroad. $3 billion of aid flows from the US to Israel every year on the grounds of our shared values and purports to defending the Israeli democracy in the Middle East. Maybe we could spend some of that political capital to start a conversation about human rights and the Palestinian Arab minority in Israel. That would be a great way to kick off your “American Century”. 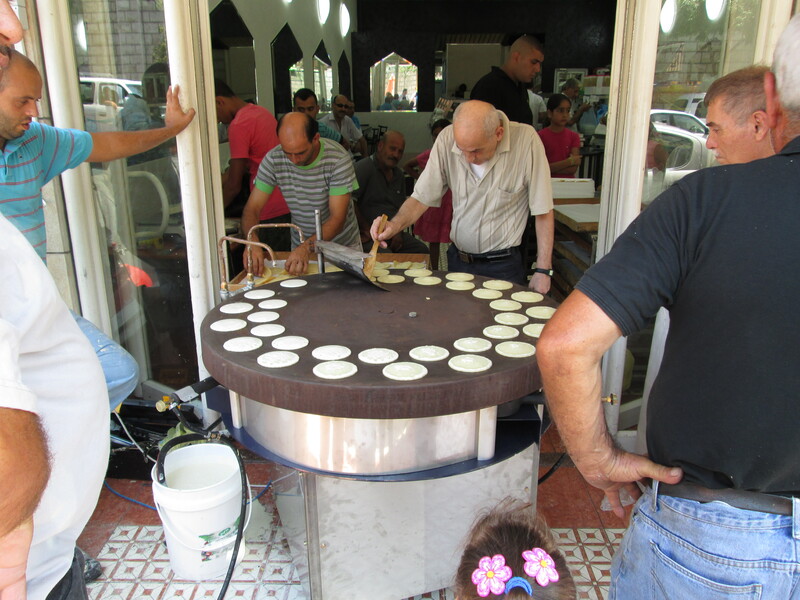 Call the next hundred years whatever you want, when you are walking around the streets of Jerusalem’s Old City this weekend, you are going to want try some of that famous hummus. 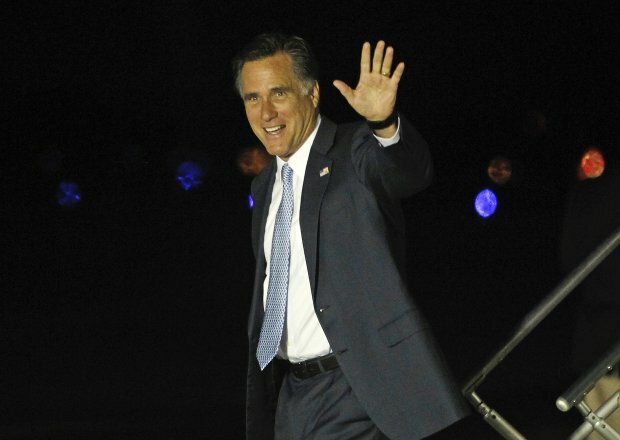 Mr. Romney, should campaign calculus determine the ethnicity or religion of the person who sells it to you? I’m telling you, it’s all delicious. In anticipation of the upcoming meeting of the EU-Israel Association Council, the Arab Association for Human Rights (HRA) would like to welcome the opportunity for a review of those issues that have affected the Palestinian Arab minority in Israel this year. This meeting comes at a crucial time for the Palestinian Arab minority. There are ongoing abuses of human rights being perpetrated in Israel the OccupiedTerritories. The HRA calls for an immediate definition of clear human rights and International Humanitarian Law (IHL) benchmarks with which Israel should comply before the EU considers expanding bilateral relations. 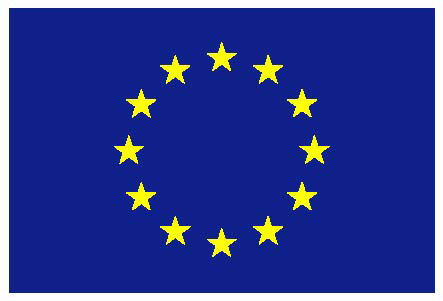 The HRA encourages the EU-Israel Association council to address human rights abuses committed in the Occupied Territories (OPT). The Council should concern itself with the illegal closure of the Gaza Strip, restrictions to freedom of movement, forced displacement in Area C, violations of international law in East Jerusalem, illegal settlements, and the general culture of impunity in Israel. In accordance with the HRA mandate for the protection of the human rights of the Palestinian Arab minority in Israel, the HRA would like to specifically call for the Council to review the abuses inherent in the “Prawer Plan” for the Arab Bedouin relocation in the Naqab. The “Prawer Plan law”, or “The Law for Regulation of Bedouin Settlement in the Negev”, was passed on January 3, 2012 and is a part of the government-approved redistricting of the Naqab in a discriminatory effort targeting the indigenous Palestinian Bedouin residents. In effect, this law would cause the immediate displacement of up to 70,000 Arab Bedouin citizens of Israel. The HRA would also call the attention of the EU-Israel Council to the many discriminatory laws being considered by the Knesset currently. The recent Supreme Court ruling to uphold the Citizenship Law is particularly deserving of focus. It restricts Palestinian Arabs citizens of Israel from living with their spouses from the OPT or “enemy states” including Syria, Iraq, Iran, and Lebanon. The agreements made on May 14th and 15th of 2012 regarding the upgrade of status for many Palestinian Arab administrative detainees in Israel should be upheld. Provisions of those agreements that have not yet been allowed include; the renewal of family visitation, ending the practice of solitary confinement, and the release of those prisoners who were promised to be set free. These prisoners continue to live in conditions which violate IHL and the UN Convention against Torture. The “Nakba” law is another affront to internationally recognized human rights. This law restricts the Palestinian Arab minority of Israel from publically demonstrating in reference to the Nakba on Israeli Independence Day. These are laws in the process of approval in the Knesset or laws that have already been deemed legal and the HRA believes that the EU-Israel Council should review the human rights violations implicit in their design especially considering the content of Article #2 of the “Association Agreement” which is a stipulation for the protection of human rights. The first two facts are unassailably true. There is a soccer team that plays here. Their season starts in September and I am looking forward to attending games. 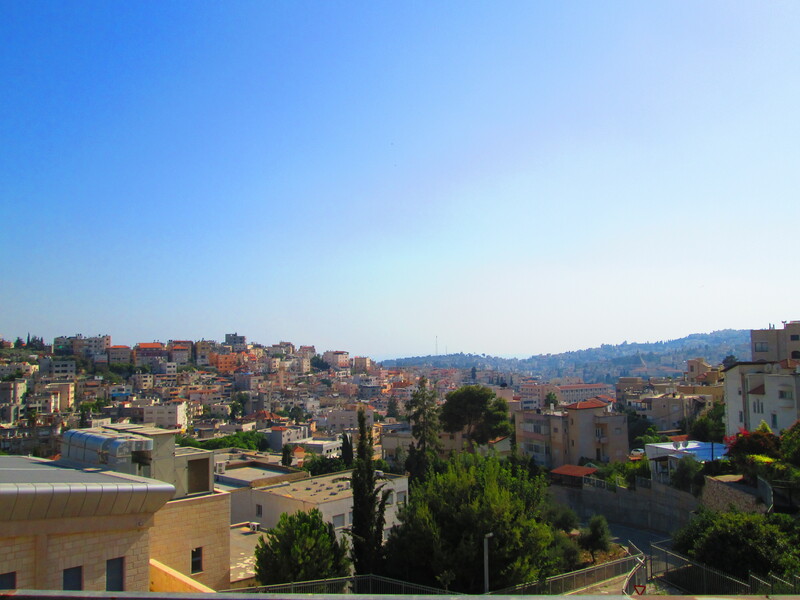 Nazareth is the place where Jesus grew up and the Basilica of the Annunciation dominates the Nazarene skyline. However, the final fact is a bit more nuanced than I had been expressing. There are one hundred and ten thousand people in Nazareth. Sort of. What I did not know is that there are two cities with the name Nazareth. Nazareth, the first, is the capital city for the Arabs in Israel and is the ancient city where Jesus walked. 60,000 people live here. It has a vibrant city center and many peaceful residential areas. 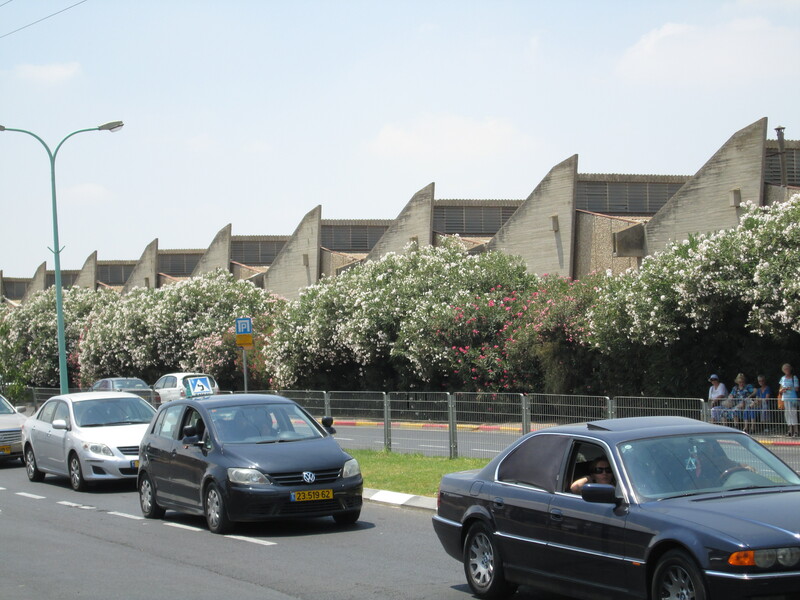 Natzerat Illit (or Nazareth Illit, “Upper Nazareth”), the second, is very different. 50,000 people live there. This is the city which Yu’val Ne’aman was referring to in the quote above. 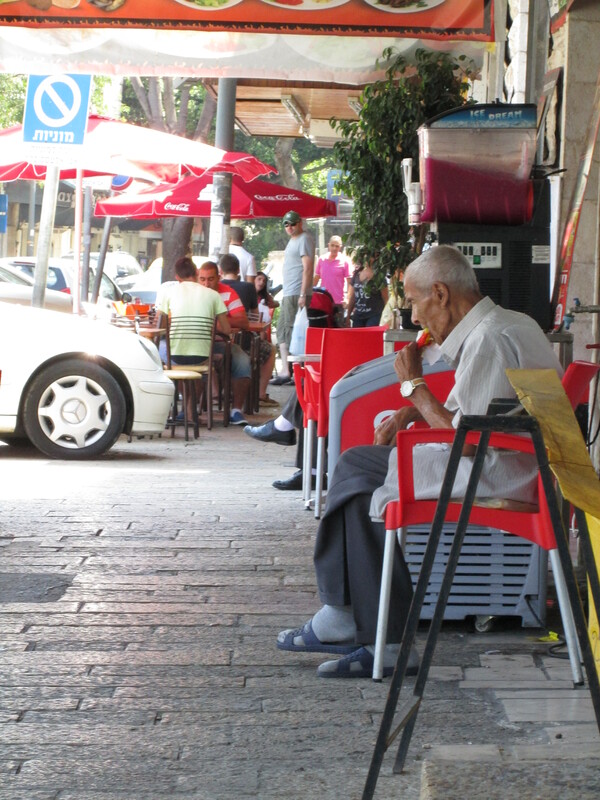 The city was founded in the early 1950′s as part of the “Judaization of the Galilee” program. The Israeli government was trying to maintain the Jewish majority by designating certain land for development by Jewish settlers. 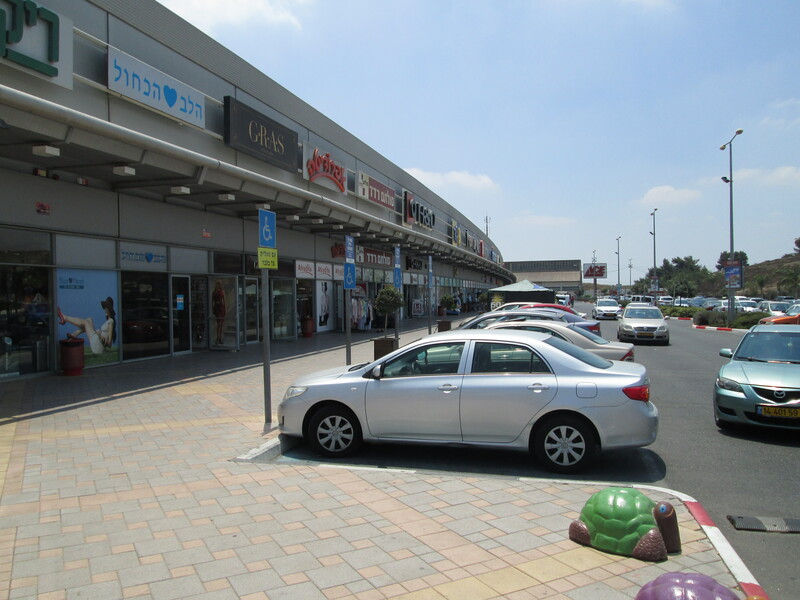 Anyone who has been here can plainly tell you that Nazareth Illit is more than a separate neighborhood. It is a self-sufficient, separate city all its own. Where the skyline of Nazareth is a patchwork of minarets, winding roads, and the great Basilica; to look at Nazareth Illit is to gaze upon 20-odd uniformly tall apartment buildings built on a grid. At sunset the rays of light hit the buildings of Nazareth Illit on the same side as each other. There is not much variation. Sunset over the rolling hills of Nazareth is reminiscent of a kaleidoscope. Rooftop gardens dot the different sizes of buildings and the call to prayer sweeps across the cityscape as the line of night passes each of Nazareth’s mosques. This is a city with ancient history permeating every block. This was Mary’s Well, that used to be Joseph’s workshop, the owner of that tourist shop found Roman cisterns in his basement (you can pay ~30 NIS for a tour). 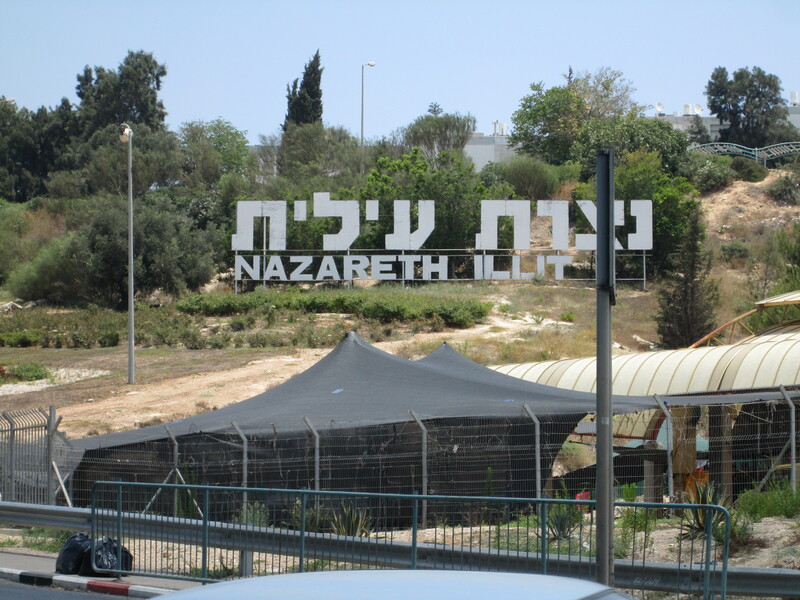 Nazareth Illit was founded by Jewish settlers in order for the new Israeli state to consolidate power over the Galilee region. No one knows exactly when or by whom Nazareth was founded. This one looks familiar, right? Yeah, that’s Nazareth. 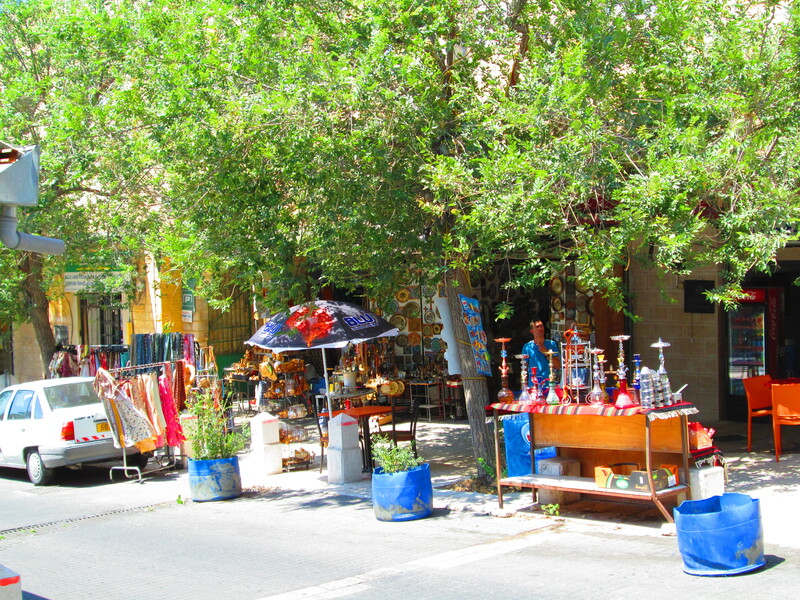 These are a couple of shops near the center of Nazareth. It was a hot day and those popsicles were looking pretty tempting. Saturday finds the famous Mahroum’s Sweets packed to the gills. Local pastries, don’t mind if I do. The cab ride to Nazareth Illit took about ten minutes. Normally I take the bus around Nazareth, but there is no local line that goes to Nazareth Illit on Sundays. These really are two different cities. This is where the cabbie dropped me off. My first thought: gosh, this looks like suburban Columbus, OH, where I grew up. Now that is a patriotic car dealership. It’s hard to believe this suburban sprawl is a short cab ride from Mary’s Well. Time to cue up some Arcade fire on the ol’ iPod. This is actually an entirely different mall from the one above. This one has a Domino’s Pizza in the food court. Too bad I was full from leftover baklava from Mahroum’s Sweets. What’s that through the fence? 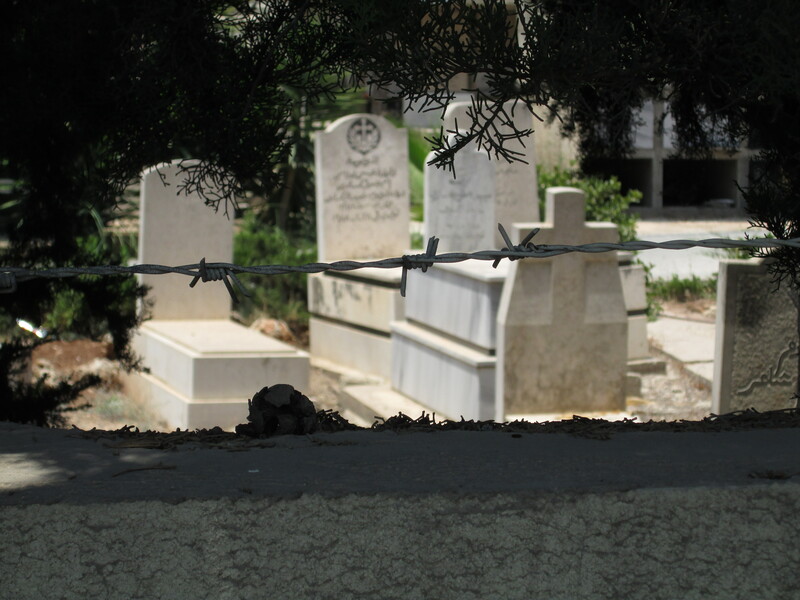 An Arab cemetery. I stood in the exact same place taking this picture and the one directly above it. That cemetery is one barbed wire fence away from the mall’s parking lot. I did not stay long in Nazareth Illit. There is probably more to it that what I saw on Sunday and the towering high rises that dominate the view from my apartment’s roof. Until I find out otherwise, I’m not going back to Nazareth Illit. Well, I will probably go if I get a hankering for a delicious slice of Domino’s pie, but other than that, probably not. Okay, maybe I’ll be interested in purchasing some consumer electronics. I would go back to that mall for those. These cities are so different, and so close. When I talk to friends back home about living in Israel, I don’t have a scripted response for their questions ready to go. It is a complicated place. What I can offer them now is a better understanding about what it means when people say “Arab Palestinians and Jews are living side-by-side”. In the case of Nazareth, as we’ve learned, it means two very different cities, on neighboring hills, sharing a name. UPDATE: Here is an interesting video from local journalist Jonathan Cook in which he discusses the history and present conditions of the relationship between Nazareth and Nazareth Illit. Ten days ago Amane Tatour turned eighteen, but today she is not a soldier. She chose to exercise her exemption from the Civil Service, which means that she will not be joining the Israeli army any time soon. Amane is a Palestinian Arab living in Israel. That is one of the few groups that are afforded exemptions from the mandatory universal conscription into the Israeli military or the National Service. By avoiding service she volunteered to pay the Israeli government an additional 12006 NIS in taxes over the course of her lifetime. No one wants higher taxes, but it beats the alternative: implicitly approving the Israeli policy of linking human rights to civic duties. Unlike religious students, newly married or pregnant women, Palestinian Arabs living in Israel pay an additional 1% tax should they take the exemption option. The tax is incurred every year the subject is of an eligible to serve. That makes 23 years of paying for the privilege of not serving. The revenue gained from the 1% tax goes towards the funding of benefits programs for veterans of military service. Veterans receive one free year of tuition at designated universities and other similar rewards. Of course, there are options inherent in the service; not every eighteen-year-old will be trained to shoot a machine gun. The National Service is another choice. 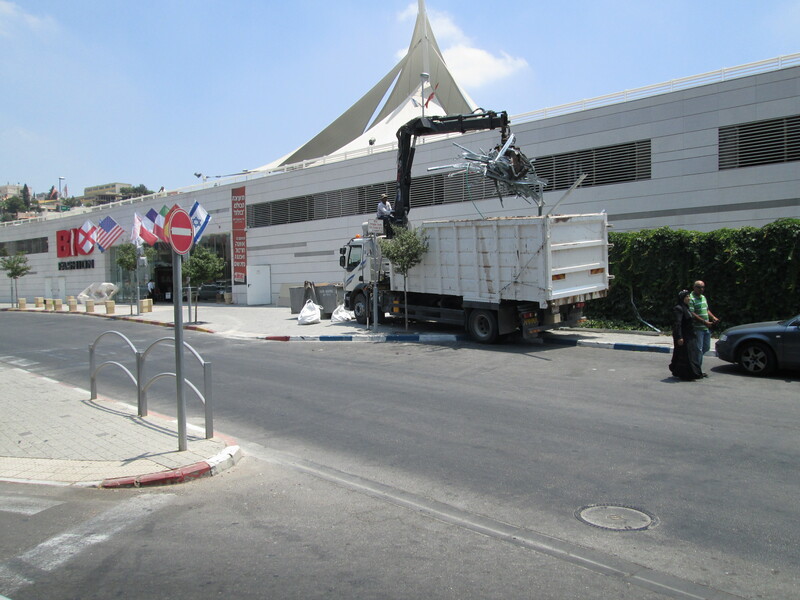 This alternate program offers various nation building and public works-type jobs to the pacifist segment of Israel’s youth. The New York Times’ Jodi Rudoren recently published an article exploring the National Service option specifically in the Galilee area of Israel. So why isn’t Amane in uniform right now? On her Myspace page she identifies her hometown as “Nazareth, Palestine NOT IL”. In principle, Amane and her peers refuse to serve in the same branch of government, the Defense Ministry, that operates the occupation of Gaza and the West Bank. The decision not to serve is also an expression of outrage over the relationship the Israeli government has assigned to “rights” and “duties”. Regardless of the ostensibly conciliatory National Service option, the concept of rewarding the performance of a civic duty with internationally acknowledged inherent human rights is unsanctionable. The immanent success in Amane’s future is apparent to everyone she meets. This is a young woman with creative prowess and a lust for life. In her summer away from school she is writing and directing a film with help from one local NGO and focusing more on her burgeoning rap career. For the last four years she has been a youth facilitator and a leader in the Arab Association for Human Rights’ Haq youth group. As one half of rap duo “Dmar” (Arabic for destruction), she has the stage presence of a seasoned professional performer and the charisma of a star in the making. Amane and her partner, Mai Zarqawi, formed the band in 2005 when they were both under the age of 15. This video of a performance Dmar gave in June 2009 currently has 5,693 hits. That means that roughly one in ten people in Nazareth have seen it. Committing to Civil Service would rob her of some very formative years, and it should not be required of her in exchange for basic human rights. Being from a small village north of Nazareth, the Arab capital of Israel, Amane has grown up around people who have reason to harbor ill will towards the Israeli government. The issue of national loyalty is tricky in Nazareth. Her struggle is indicative of the difficulty many of her peers are having with this decision. Choose the attractive benefits package and a brief service or a tax penalty and freedom? On one hand, doing the National Service can be a good way to help out the community. One such program is the Nazareth Summer Camp. It is staffed by servicemen and women, and services the kids of Nazareth. On the other hand, committing to National Service could be seen as a betrayal of national identity. These people are indigenous to the land. This is Palestinian Arab minority of Israel; it is absurd to ask them to serve in the same army that oppresses their uncles, aunts, sisters, and brothers in the West Bank and Gaza. 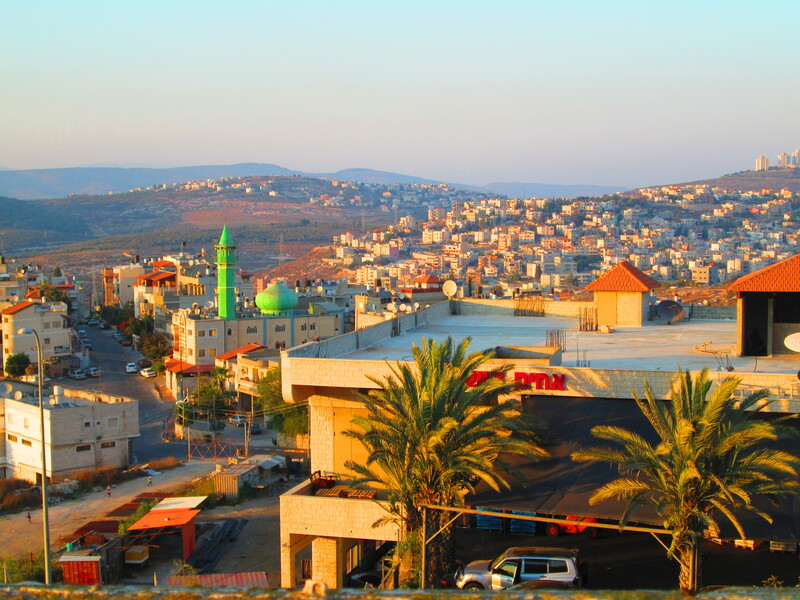 So, in a town like Nazareth where politics and history is everything, Amane’s choice was easy. There was no conceivable way she could commit to serve. 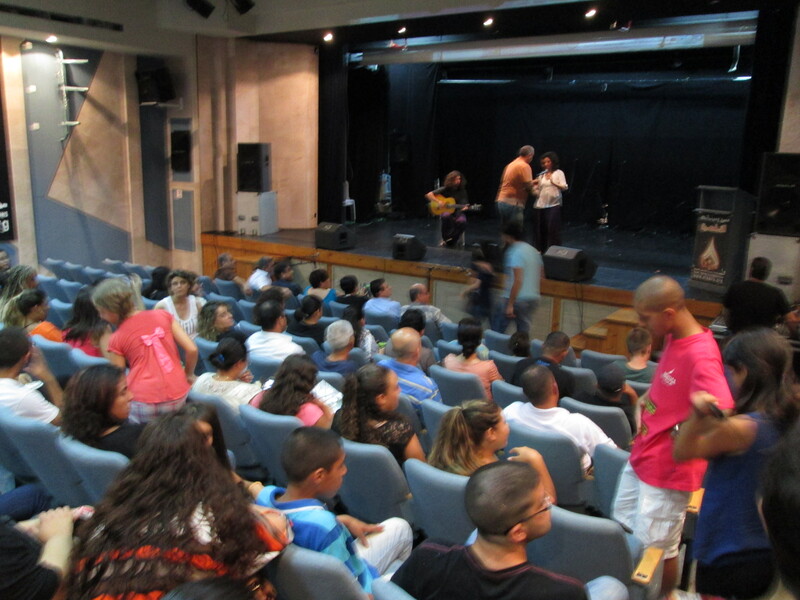 Last week the Arab Association for Human Rights co-sponsored an evening of music, poetry, and dance to bring awareness to the effects of the Isreali conscription laws. 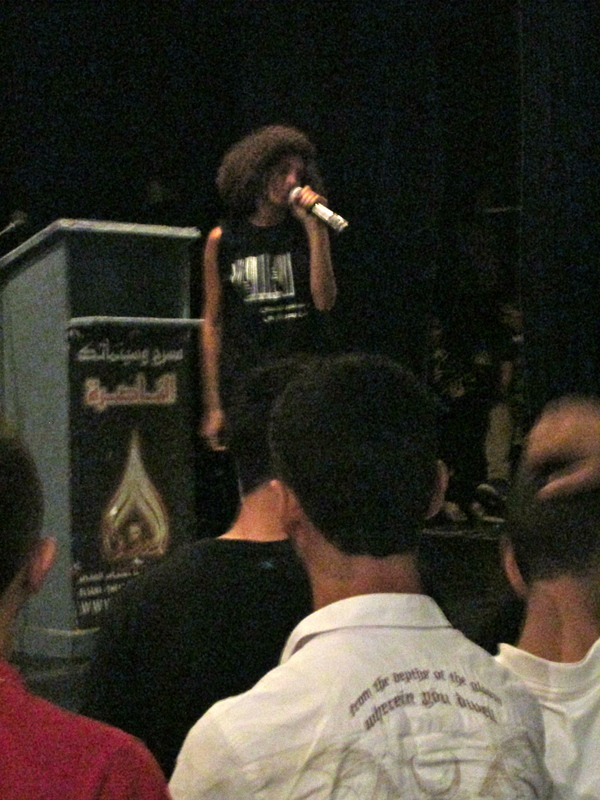 The other sponsors were Baladna, the Initiative for Arab Youth Action, and Women Against Violence. “I am not a soldier” the theme for the evening permeated every performance. Though the content was generally political, the tone was light. One firebrand speaker called for an end of Israeli oppression; he was followed by a guitar player eager to crack jokes between songs. The show climaxed with a moving performance of the Palestinian national anthem by the Haq Orchestra for Art; a group the HRA-sponsors. The audience showed up to have a nice night out and to display solidarity. They got to do both. This was a public outcry for the end of such a repugnant policy and quite the occasion for Nazarene socialites. 250-odd people were in attendance for the event. As the crowd shuffled out of Cinematech near Mary’s Well in ancient Nazareth, there were many glowing smiles displaying the strong sense of community which really was the star of the show. A community united against this oppressive policy last night, but their message was overshadowed by national political news. It was announced last week that Shaul Mofaz’s Kadima party would be leaving the ruling coalition after only 70 days. The division was apparently caused by intractable differences on the issue of universal conscription. Mofaz’s secular Kadima wants to end the exemption for ultra-orthodox religious students. Benjamin Netanyahu, PM and head of Likud, decided instead to honor his commitment to the orthodox, religious parties in his coalition, who support the exemption for religious students. There was no mainstream political party advocating an end to the 1% tax penalty for Palestinian Arabs living in Israel who seek exemption. There were, however, many conservative politicians calling for an end to the Arab exemption option in the first place. Mainstream Israeli politics are one standard deviation away from the Arab public’s desires on the spectrum of opinions on this issue. In Nazareth, life goes on. The rewards for serving look more and more attractive to eighteen-year old Palestinian Arabs. But, understanding that in order to receive them they must tangentially approve an unlawful and immoral policy happens to be a powerful motivator as well. For these reasons the Arab Association for Human Rights seeks your support. Help us reach out to young people like Amane. Like us on Facebook, follow us on Twitter, read our new Intern Blog to keep track of future events like this one! My name is Paul Karolyi. I am recent graduate of the George Washington University where I majored in History and International Relations with a special concentration on Middle Eastern Affairs. This year I will be working for the Arab Association for Human Rights here in Nazareth. I see this blog as a place to share my personal thoughts and feelings about the issues we are dealing with at the HRA and life in Nazareth in a more general sense. There will be no deep esoterica concerning the intricacies of international law here. I’ll keep it light. If either my ongoing campaign to support New Gingrich’s Moonbase plan, my intense love of Nacho Cheese Doritos, or my weakness for a good pulpy Sci-Fi novel gets in the way, so be it. The Prime Minister’s candor comes at a time when growth and prosperity in the State of Israel are split clearly along racial and religious lines, and sheds light in particular on recent sweeping legislation that explicitly excludes the 1.3 million Palestinians with Israeli citizenship from Israeli society. While the native Palestinian population inside the Green Line has proven persistently difficult to “deduct” from either their land or Israeli demographics, the Palestinian minority trails the Jewish majority in all significant measures of participation, achievement, and quality of life. According to the 2011 Statistical Abstract of Israel, the unemployment rate of Arab citizens in Israel is 25 percent higher than that of Jews, while the infant mortality rate for non-Jewish citizens (7.1 per 1000 births) is more than double the rate of Jewish citizens (2.9 per 1000 births.) Disturbingly, the rate of Arabs registered with state social services was 150 percent that of Jewish citizens. 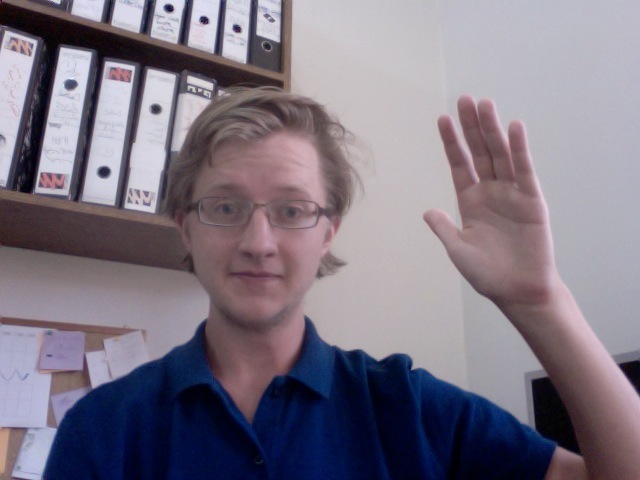 In a media environment where it is thought of as encouraging to see coverage of the relentless violence against Palestinians by illegal settlers in Hebron, or the dehumanizing powerlessness of Palestinians watching their homes being demolished in the Occupied Territories, it is easy and common to consider these data through a spectrum of relative Palestinian suffering. After all, only so much attention and resources can realistically be devoted to the Palestinian cause. What is lost in this perspective is the shared identity that unites these Palestinians, on both sides of the Green Line, in the eyes of the Jewish State. While these standards form the foundation for so much of the public discrimination that exists today, this legal jargon fails to convey the impact of this inequality on human lives in the Israeli system. In State-run polls, relative to Jews the Arab minority reported less satisfaction with not only their financial security but also their lives. Arrestingly, Arabs reported that they “have no one to turn to in times of crisis” at more than twice the rate of Jewish citizens. It is into this environment of widespread and visible racial inequality that the Israeli government under Netanyahu has passed, renewed, and legalized an impressive shock of legislation that widens the divide between Jews and Palestinians under Israeli rule. The methods and purpose of these laws directly target Palestinian quality of life and expose the application of racial subordination in a multi-ethnic society. 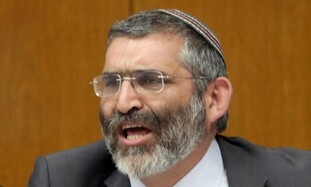 In March of last year, the Knesset passed the Admissions Committees Law, which authorizes communities “to bar residents who do not suit the lifestyle and social fabric of the community.” The law gives full discretion to small panels, or “admissions committees” of citizens to screen potential residents of communities using vague and arbitrary standards, legalizing racial exclusion in more than 45 percent of cities and towns in Israel. Also in March of 2011, the Knesset authorized Amendment 3 of the Israel Lands Law, which defines anyone who is not entitled to immigrate to Israel under the Israeli Law of Return (1950), i.e. non-Jewish persons, as “foreigners”. The law prohibits any entity (public or private) from selling or renting out property for a period of over five years, or from bequeathing or bestowing rights to private property registered in Israel to these “foreigners”. In refreshing contrast to the impotent language typically used by CERD and other observing parties, Article 24 of this country report called on the State to “take immediate measures to prohibit and eradicate…all policies and practices of racial segregation and apartheid” in the Occupied Territories. When the UN summons the political will to recognize the vivid reality of apartheid, particularly in the face of ongoing American hamstringing, there is no more appropriate a time to name and reject the ideology in whose name Jewish life is valued above Palestinian life in all of historical Palestine. The ideology is Zionism. An arrogant quip by the Prime Minister about excluding and “deducting” minorities does not convey the realities of dehumanizing Israeli policies in Palestinian daily life. And the very real differences between Nablus and Nazareth will not be addressed by denying Palestinians’ shared identity as the focus of the ultra-nationalist racism of the Jewish state. The Nakba (catastrophe) is commemorated to honor the more than 700,000 Palestinians that were displaced and driven from their land during the founding of the Israeli state in 1948. In codifying this amendment the state is criminalizing the most basic of civil liberties. Through vague language and transparently discriminatory motivations, this provision creates an atmosphere of fear and persecution that fundamentally censors teaching about the creation of the Israeli state. Forced to choose between essential funding and the conscientious teaching of history, teachers and educators are placed in an impossible bind in which all Israeli students suffer. “It’s fascist chutzpah and a new low point in the slippery racist slope on which the Israeli government, Knesset and Israeli society are descending,” the Arab Education Monitoring Committee said. And these changes don’t end in the classroom. In February more than 260 Israeli teachers signed a letter in opposition to a recently expanded education ministry program taking students on “heritage tours” to Jewish settlements in the West Bank city of Hebron. The settlements have been condemned as a breach of international law and an obstacle to the peace process by the international community and Palestinian officials. These comments by Saar represent a typical and dangerous denial of the Palestinians’ status as the native people of Palestine. 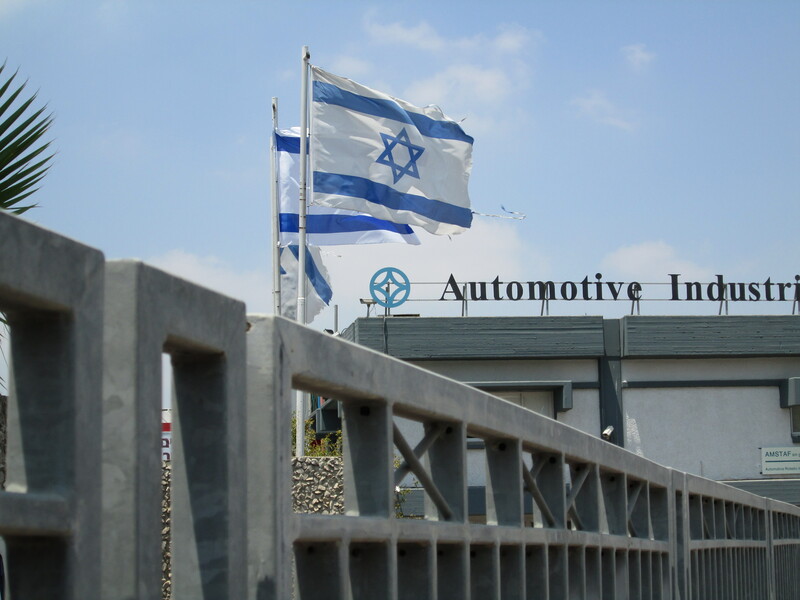 The ongoing Israeli appropriation of this land is consistently distorted by government officials, as a strategic silencing very much parallel to current education policy. The historical and ongoing disparity between Jewish and Palestinian education in Israel illustrates the unacceptable implications of these efforts to prioritize Zionism in public education. Since the founding of the Jewish state Palestinians in Israel have been educated separately from the Jewish majority, while the curriculum and distribution of federal resources are dictated by the state. Palestinian academic achievement has always trailed that of the Jewish majority, and this gap is reinforced by the consistent, historical subordination of Palestinian education in both resources and attention. This discrimination continues. Supplementary funding plans throughout the 1990s and the new millennium failed to either equalize these two systems or account for past discrimination against 1948 Palestinians. Furthermore, even these insufficient plans were not fully implemented. In 2008, 31.9 percent of Palestinian students earned a matriculation certificate after high school, nearly half of the Jewish student rate of 59.7 percent. Among Palestinians aged 18-39, 1.8 percent were studying for their first degree in university, half of the Jewish student rate of 3.6 percent. These data must be understood in the context of their very real consequences in quality of life, economic mobility, and sociopolitical awareness of the Palestinians in Israel. Pointedly, even as the government has been forced to acknowledge disparities in funding, the education ministry claims that it is impossible to monitor and report the resources allocated to Palestinian education. The strategies highlighted in the document include strengthening the identity of the Palestinian people in Israel, the teaching of collective Arab and Islamic roots, and affirming the national and political rights of the Palestinian people. The comprehensive, heavily-resourced Israeli campaign to control and silence Arab culture through the education system is currently operating in the open. The overtly discriminatory implications of these policies are being justified and excused through pretenses of religion, fear, and ultra-nationalism. Palestinian demands to meaningfully participate in the decision making process for education reflect the persistent failure of the “Jewish and democratic” state to respect the rights of its minority students. In a land where so much meaning is derived from history and narrative, the exclusive ideology of Zionism is harmful to not only Palestinians in Israel, but all children who pass through the evolving classrooms of Israel’s schools.